This CD was a joy to conceive and produce: the fruit of many years’ planning and close musical association with the two composers whose work is represented. Most of it is previously unrecorded, or has long been out of print. The recording includes performances by a couple of internationally-renowned wind players — Pat Spencer and Jean Kopperud — as well as some of the best instrumentalists in NY’s Hudson Valley. We recorded it at Grammy Award-winning engineer Tom Mark’s studio in West Shokan, NY — recording in analog to keep the warmth of a small concert-hall setting, and editing in digital. Composer Baikida Carroll was music producer. “Soprano of considerable technique along with perfect diction…All of the singing is quite lovely.” — Fanfare, recording review. 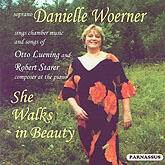 “Danielle Woerner has the kind of voice that sends shivers down your spine with its trueness and variety. She’s equally at home in opera, Gilbert and Sullivan, and concerts.” — Times Herald-Record, Middletown, NY. “Treated her capacity audience to excerpts from operatic standards with all the aplomb of a staged performance…. Her voice is not only robust and resonant, but graceful and sensitive…. She drew from the arias all the joy and pain that Monteverdi and Mozart created, radiating happiness through body language as well as in the ease with which she floated through florid lines of melody.” — Times Herald-Record, Middletown, NY.